The Music Box is currently running a weekend matinee series titled "Weepie Noir: The Dark Side of Women's Pictures," dedicated to those studio melodramas influenced by the expressiveness of film-noir style. The first film on the program is Vincente Minnelli's adaptation of Flaubert's Madame Bovary, an ideal selection. Minnelli, of course, is among the most expressive American filmmakers ever, a master of aesthetic design and transcendent style. Andrew Sarris famously wrote that the director cared more about beauty than art; while he meant this somewhat pejoratively, there's plenty of truth in such a statement. Minnelli's cinema uses aesthetic fetishizing as a formal principle, and features characters who relish beauty and enchantment, or at least what they perceive to be enchantment. At the heart of the director's occasionally garish and unabashedly expressive work is a deep sense of longing, of characters searching for an ideal existence and encountering societal, political, ideological, philosophical restraints. It's the sublime emotion that exists just below his bawdy surfaces that give his films their radiance. You can see my five favorite Minnelli films below. 5. The Long, Long Trailer (1954) A divisive film, one that rubs even the most devout Minnellians the wrong way, but I find its deliberately grating qualities intellectually stimulating, even charming. The director often uses aesthetic and thematic design as a means of critical inquiry. Here, he seems to investigate the mechanisms of situational comedy by blowing the format to pieces and reassembling, almost anticipating Andy Kaufman. 4. Madame Bovary (1949) This lavish adaptation of the Flaubert novel also serves as a satire of the Hays Code. Naturally, the classic story of the adulterous wife didn't quite jibe with the Motion Picture Production Code, so the director included dramatized segments of the author's obscenity trial in order to appease the censors and effectively illustrated the studio system's more archaic practices without appearing subversive. These knowing elements aside, the film is an aesthetic marvel; the ballroom scene still astounds. 3. Some Came Running (1958) Dave Kehr describes this melodrama, perhaps Minnelli's most personal film, as a "neon epiphany," and I can't think of a more apt description. The penultimate sequence, in all its phantasmagorical grandeur, remains justifiably iconic. All visual splendor aside, this might be the director's most socially aware work. The film offers an incisive and enthralling look at a very particular kind of American life, in which unspoken anguish lies beneath the comforts of upper-crusty provincialism and "Midwestern nice." 2. Lust for Life (1956) Similar to Mike Leigh's 2014 film Mr. Turner, a biopic about painter J.M.W. Turner, this look at the life of Vincent van Gogh adopts some of the painter's own techniques to consider the nature of style and the methods of aestheticism. In a compositional sense, the film has a realistic feel, but Minnelli's graphic mise-en-scene and poetic transitions give the impression of moving paintings, and when the film is at its most dazzling, there's a sense that the director is reshaping the very nature of existence. 1. 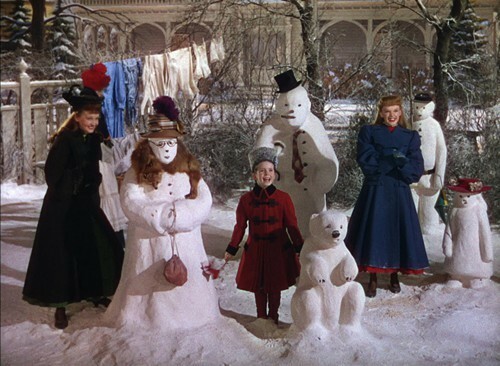 Meet Me in St. Louis (1944) Minnelli's masterpiece, one of the most precise yet seemingly free-form musicals ever made. The director's highly detailed approach occasionally got the best of him (think of all those busy frames in The Cobweb and Designing Woman), but nothing feels overabundant or unnecessary here. Bright and funny yet melancholic and even a bit cynical, the movie is broadly emotional, all the better to match Minnelli's elaborate set pieces and inspired musical numbers. Most point to the famous "Have Yourself a Merry Little Christmas" sequence, but my favorite number is "The Trolley Song."